The Welsummer is a large active bird, which is known for it’s unique colouring of its eggs. Originating for the small town of Welsum in the eastern Netherlands this chicken breed is easily handled and loves a free-range environment. The Welsummer is a large, upright, active bird with a broad back, full breast and large full tail. They head has a single comb, medium wattles, almond shaped ear lobes and a strong, short beak. They have yellow legs, which fade to pale yellow in summer and reddish bay eyes. 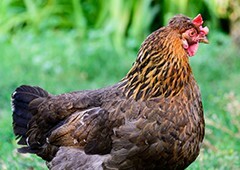 Personality: friendly, easily handled birds, which love to free range and forage for food but can also be kept in runs quite happily. They do go broody but not usually until late spring but are not particularly good mothers. Chicks are strong and are easily sexed as females have much darker head and back markings than males.